Dynamo Electric Taxi - The Worlds First 100% Electric Black Cab. The Dynamo Electric Taxi is the emission free future has arrived and it’s 100% electric and ready to order soon! Dynamo Electric Taxi For the driver & the pedestrians, those going about their day to day activities like walking to work or taking children to school. 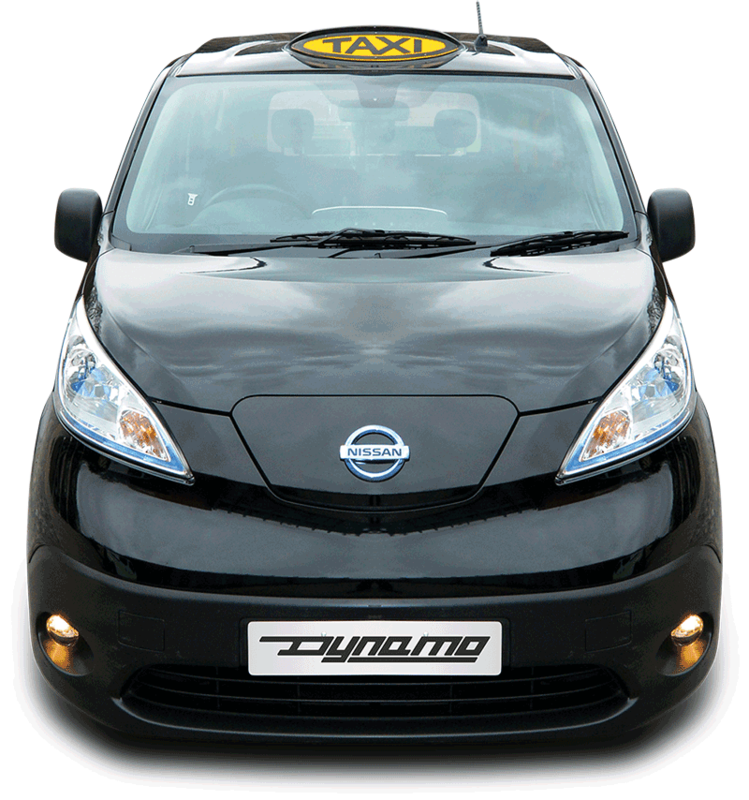 Your new Dynamo Electric Taxi Cab comes with a full warranty to cover all key components and has the full support of the Nissan national network. *based on 40 kWh battery size. **based on 40 kWh battery size with 6.6kW onboard rectifier. Clean Air Zones are being created by local authorities across the UK. By 2020 these will be widespread and diesel powered vehicles will be actively discouraged from entering towns and cities. The new Dynamo taxi is tailpipe emission free and will be welcome everywhere. The Dynamo offers you everything you seek in a fleet taxi. It’s cost effective and a future proof solution, providing an unbeatable combination of lower running costs and zero emissions. This is the perfect Electric Taxi Cab for any fleet operators. The Dynamo has been designed with the driver in mind. It has been designed for all shapes and sizes with very high technical specs, providing an unbeatable combination of comfort reliability and piece of mind for the driver of today. Dynamo took the worlds first 100% electric black taxi cab out on the road for cabbies to have a test drive and to find out all of the facts. Click find out more and you will find all of their comments. We have had a positive experience with our Nissan fleet, even the drivers who were anxious to start with are now very happy to drive a 100% electric vehicle. They tell us a 10 hour shift is les tiring with an EV an the e-NV200 means we can extend that experience to the drivers who were previously in diesel minibuses. Each Driver is saving between £120 and £130 a week on fuel so they’re delighted. When we speak to other operators they tell us range and battery life are big factors in preventing them considering electric. Then, when we tell them ours has done 100,000 miles and still has full battery health they’re left speechless.